Preserved Steam-powered Machines celebrates the steam preservation movement. Preserved steam railways have been part of Britain's heritage landscape now for more than half a century, preserved steamships for more than a century. 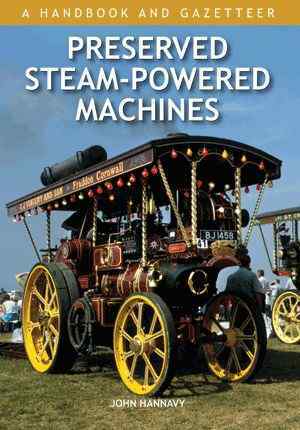 This book may, in part, be nostalgic, but it is primarily a celebration of the diversity of preserved steam in the second decade of the 21st century, and the skill and perseverance of the volunteers who have ensured that steam will never die. Steam railways, of course, are celebrated, but so are the steamboats and steamships which have escaped the breakers, and many of the industrial steam engines which have survived well beyond their usefulness in Britain's mills, factories and mines. Traction engines, and the annual rallies they are driven to, are also covered. The book contains a gazetteer of major attractions throughout Britain, giving contact names, addresses and website details. Illustrated throughout in colour, this handy hardback is the essential guide to where the mighty machines of Britain's industrial greatness can still be seen and enjoyed. John Hannavy is a writer and photographer, and an unashamed steam enthusiast, and has written extensively on the subject. Until retirement, he was Professor of Photography and Photographic History at the University of Bolton. His work appears in many leading magazines, and this is his 37th book.